Quick Take: Choosing a mattress online can be difficult because you haven’t had the chance to really test it out. This is why you need to rely on website information and reviews. This Purple vs Lull mattress comparison will allow you to compare key elements of these two popular mattress brands. This Purple Lull comparison is your chance to get a side-by-side look at which mattress is cooler, cheaper, and made with better materials. You’ll also be able to compare risk-free trials, warranties, and other details! Here is our Purple and Lull mattress reviews to learn more! It is our hope that this Purple vs Lull mattress assessment gives you everything you need to pick your new mattress. If you’ve narrowed your search to these two mattresses, you already know that both of them are wonderful options. Now you just need to compare them to find out which is the better option for you. For example, maybe you are set on getting a firm mattress. If that’s the case, Lull would be a better choice as it’s firmer than Purple. If you wanted a mainly memory foam mattress you’d want Lull, but if you like latex, Purple would be the better option. In this Purple vs Lull mattress look, we will explore what the mattresses are made of and what they can offer you. If you keep reading, you’ll find a pricing chart with mattress dimensions for both brands. This helps you determine the best option if you’re on a budget. The end of the comparison also offers a table with basic details if you want a quick look at these mattresses. Like most online mattresses, both of these mattresses will arrive at your door in a box. Inside, your mattress will be rolled up in plastic and compressed. This makes it considerably lighter and easier to handle. All you need to do is bring in the mattress, put it where you want it to go, and unwrap it so your mattress can expand! 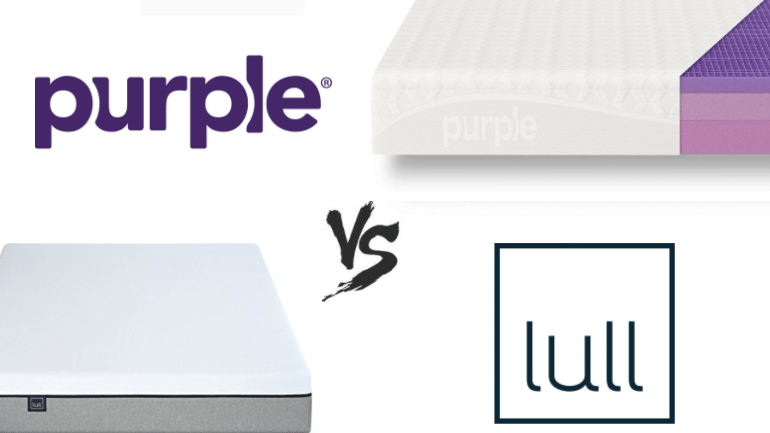 Check out the rest of this Lull vs Purple mattress comparison to learn everything you need to know about these two mattresses. Purple starts with a comfortable cover. Inside the top layer is a smart grid made of hyper-elastic polymer. The column grid helps to support you, keeps your mattress cool, and promotes pressure relief. As it’s more of a latex-feel, you’ll also notice that the mattress has a better bounce to it. It’s also highly responsive so as you move, it adjusts to your movements. Next up is 3.5 inches of poly foam, which adds more support and works as a transition between the comfort grid and the foundation. The foundation is an additional four inches of poly foam. The goal with the foundation layer is to support the mattress adding durability and extending the life of the mattress. Lull mattresses are made of multiple layers of memory foam. The top layer is a 1.5” memory foam layer that is infused in gel. Another 1.5” layer of foam is next. This layer is poly foam, so you might notice a feeling that is bouncy enough to mimic latex. The support foundation is 7” thick and it’s made of a high-density poly foam. This layer will help to ease your pain, reduce your aches, and create a cool sleep surface. Purple and Lull are both what is considered to be medium-firm mattresses. They only offer one firmness for everyone. Having a mattress that has some softness and firmness to it means that it will work with a variety of sleep positions. Whether you are a combination sleeper or you sleep on your stomach, either of these mattresses should work for you. Lull is what’s known as a medium firm mattress. Of course, Lull is a little bit on the firmer side. Out of ten, Lull would be best described as a 7.5. While there is still a bit of softness to it, this is a better option for someone looking for a firm mattress. For this reason, if you’re a side sleeper you might find this too firm for you. It really comes down to personal preference, but Lull tends to work better for back sleepers or those that sleep on their stomach. Purple is also medium-firm though it is softer than Lull. While Lull is more of a 7.5, Purple is a softer 6 out of 10. This means that while there is some firmness to it, you’ll still find it to be soft enough for side sleeping in most cases. Purple is firm enough to stop you from dealing with mattress sinkage, but soft enough that it will support and cradle your hips and shoulders when you’re on your side. One of the biggest complaints of couples that sleep in the same bed is the possibility of being woken up due to either tossing and turning or the person next to them waking up. This generally occurs because as you move, your mattress also moves. This motion doesn’t have to be felt, but it depends on the mattress you have whether or not you end up feeling things on the surface. With Purple, you don’t have anything to worry about. You can move around, and any motion will be absorbed by the foam. Motion will not be felt on the surface. That said, Purple is a mattress that excels in the areas of healing comfort, so you might not toss like you used to on other mattresses. Like with Purple, Lull sleepers have few complaints when it comes to motion transfer. Foam mattresses tend to be excellent in this area because the motion is absorbed in the foam and you don’t end up feeling a thing on the surface of the mattress. So, whether you move a lot or you find that your mattress alleviates the majority of your tossing and turning, you’ll be protected where motion transfer is concerned. If you’re looking for a luxury mattress, Purple has a lot to offer. They offer all standard sizes with the exception of Twin beds. Purple mattresses start at Twin XL and go up to California King. Pricing, especially in comparison to other luxury mattresses made with similar materials, is quite fair. You’ll pay a much lower cost than many mattresses of its kind. While prices are good, make sure to be on the lookout for Purple mattress coupon codes or other discounts as a way to make prices even better! Lull offers prices that are even better than Purple. You won’t find many mattresses like Lull available for less than $900 for a California King. These prices are great and if you have a Lull coupon code those prices get even better. If you’re uncertain on which mattress you want, pricing and dimensions are listed here so you can see what works in your budget. At the end of the day, you might be worried about buying a mattress that you haven’t felt before. Lull understands that fear and wants to make buying a mattress easier for you. That’s why Lull offers a 100-night risk-free trial. During this trial you have the opportunity to get a full refund if you’re unhappy with your mattress. Lull will take the mattress and you will get your money back. It’s all a hassle-free experience. Most people end up keeping their mattress and if they do, they receive a 10-year limited warranty. Purple also offers a very similar deal. In fact, the numbers are essentially the same! Purple offers a 100-night risk-free trial with each mattress! Like with Lull, if you’re unhappy, Purple will take back your mattress and give you a refund in the first 100 days. As for the warranty, Purple also offers 10-years. You’ll want to read it for specifics, but you can expect flaws and defects to be covered if there are any. Conclusion: What Mattress Should I Buy? Both Lull and Purple are great mattresses and thousands of satisfied customers would tell you the same thing. Chances are, no matter your sleep position you’ll be comfortable on either mattress. What it might come down to is that Lull is firmer than Purple. Also, if you need a better deal you might be inclined to pick Purple. Of course, with the risk-free trials, if one doesn’t work for you you’ll have the freedom to try again!